Welcome back! A while ago, I wrote about evaluating the value of Grand Prix playmats. In the second part of the Playmat Finance series, we are going to check out two other categories of collectible Magic playmats out there. First off, let’s start with one of my favorite playmats of all time, and the category in which the mat falls under. Dark Ascension Game Day was the first time we saw a Game Day event that awarded an exclusive playmat to each tournament’s winner. It added a bit of prestige to Game Days and made the event a little bit more competitive. The artwork featured on the first-ever Game Day playmat was the rather unassuming Thraben Heretic (does anybody even remember what the card does?). 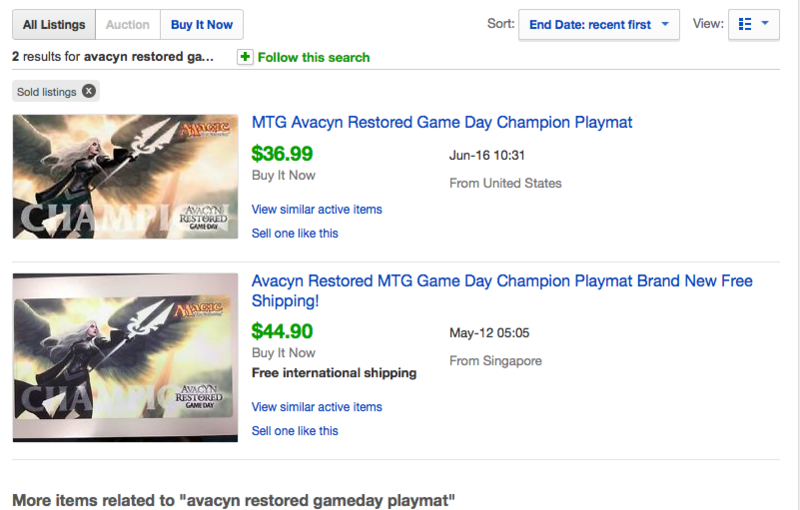 Nevertheless, the playmat is still selling for a decent price three years later. Perhaps it’s the novelty of being the first-ever Game Day playmat that has imbued it with a value of $20 to $30 on eBay three years after the event. Heck, those numbers look like a great deal when you compare it to what retailers who have the mat in stock are asking. The Avacyn Restored Game Day that followed provided a playmat with much cooler art. It featured a character that would end up being one of the most iconic white EDH cards: Avacyn, Angel of Hope. There were only two recent sales that are viewable as of this writing, but those give a good ballpark to help us estimate the price this playmat commands. As the first part of this series highlighted, the popularity of the card from which the playmat’s art originated from is the most significant influence on the playmat’s long-term value, so it unsurprising that the Avacyn Restored Game Day playmat is worth as much as Karn Liberated. While the Magic 2014 Game Day playmat art was not from a card, I believe that this treatment of Chandra Nalaar was the first time she was depicted with strands of hair rather than her usual flaming head, which may be the reason why this playmat commands an above-average price tag and is still in demand today. 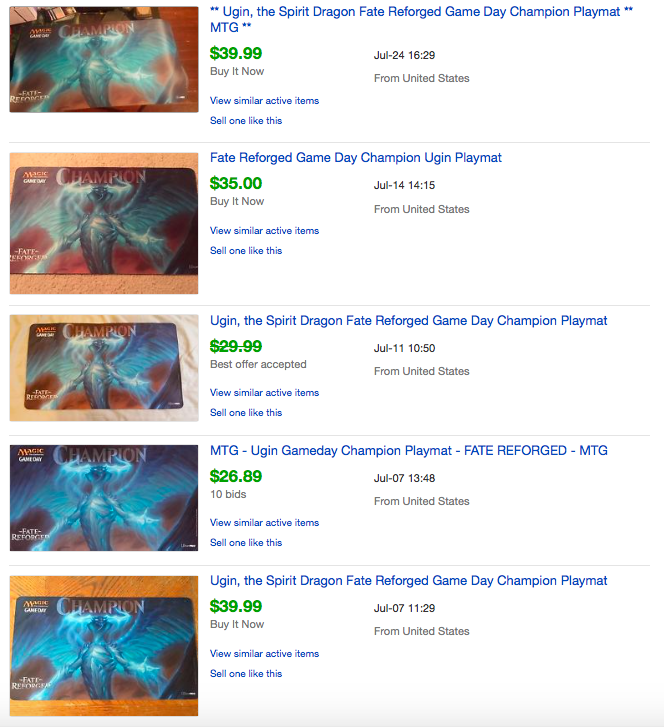 If you would like to reap maximum value out of the Game Day playmat you’ve won, the best time to sell it is during the Game Day weekend itself or within the immediately following weeks. I’ve never bought a Game Day playmat myself, as I can’t imagine how I would field an answer to inquisitive opponents asking how my Game Day went. But if you plan to buy one for yourself, you would get a better price a few months down the road. 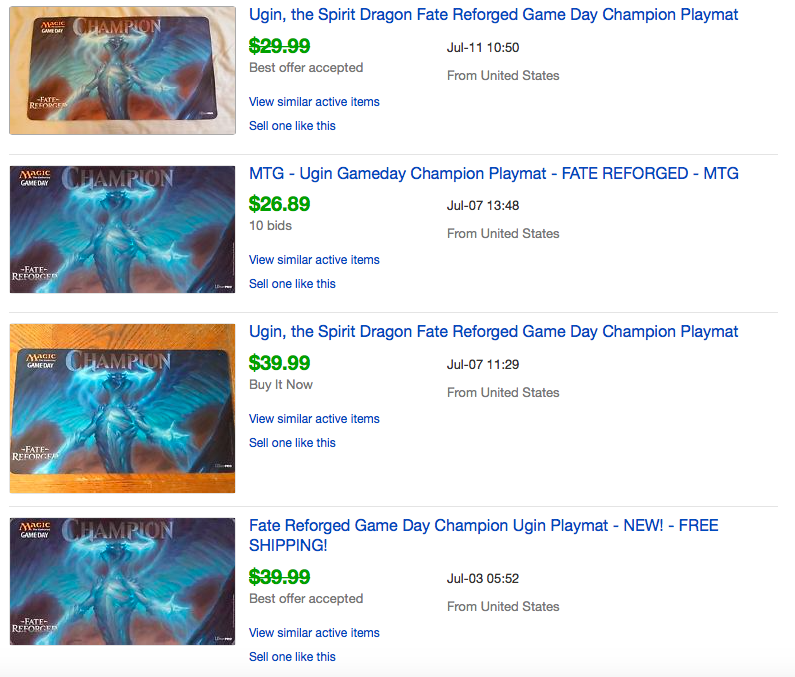 The longer you’re willing to wait, the better it is, as it takes a while for a playmat’s price to hit a stable price that better reflects its long-term value. Some Grands Prix offer one or more exclusive playmats drawn by the attending artists to commemorate the Grand Prix. While these limited-edition playmats are done by Magic artists, they usually feature artwork depicting an iconic element of the Grand Prix’s venue rather than card art (as the official playmat already features card art). I’m not sure if the artists were commissioned by the Grand Prix organizers or if these playmats were done of their own accord, but some of them do sell for a good amount. 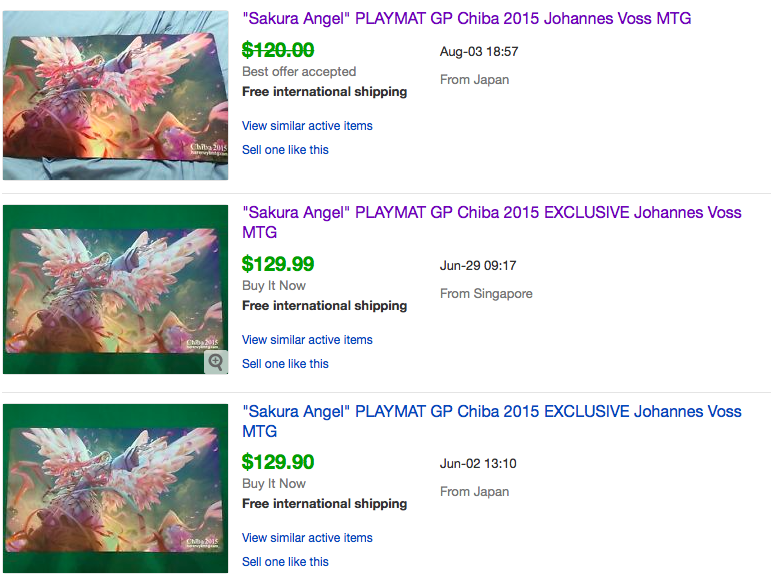 For example, only 600 of the Grand Prix Chiba Sakura Angel playmat by Johannes Voss above were sold by the organizers at that Grand Prix (300 per day for Friday and Saturday) and players who missed the insane early morning queue on both days could purchase a copy without the Grand Prix Chiba stamp at Johannes’s booth for a measly sum of 15,000 yen. Or on eBay for just $129. Perhaps Magic players just love their goblins more than their gargoyles. Or maybe it was the goblins playing hockey, which I hear is pretty popular in Canada. Then again, I have not personally set foot in Canada, and all I know about the country is from listening to The Eh Team podcast. I tried to find a metric to help me guesstimate the price of these special Grand Prix playmats: a simple non-subjective framework similar to the one I wrote about for official Grand Prix playmats in the first part of this series. 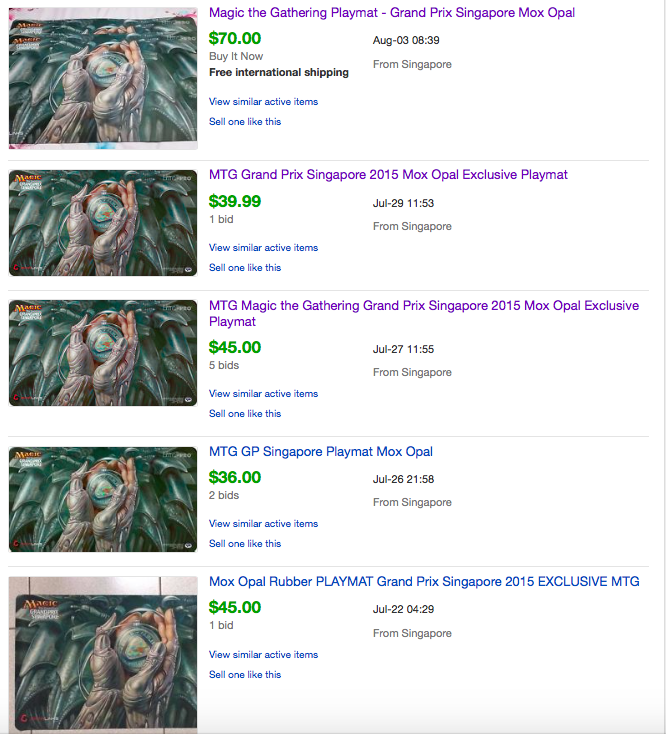 We use the metric of supply and demand to pin a value on cards, and while we can easily estimate the supply of a particular Grand Prix side event playmat, the playmat’s demand is a lot harder to gauge. A card’s demand can be approximated by it’s ubiquity in competitive formats or EDH, or even perceived casual appeal (like that one time Wizards decided to make a colorless dragon planeswalker). 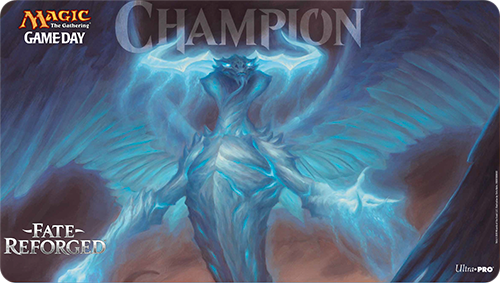 The value of official Grand Prix playmats is mainly influenced by the popularity of the card from which the playmat’s art derived. But attempting to pin a price on a special playmat with no card analog is a lot more complicated. Using a playmat’s aesthetics to determine the value of the playmat is a pitfall, as aesthetics are subjective. 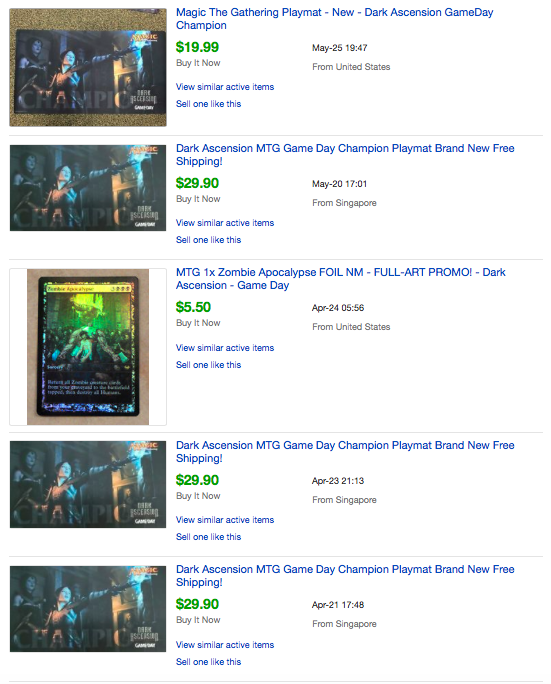 I was surprised that the Grand Prix Toronto side event playmat above was able to fetch that sort of price. I don’t even find the art appealing, nor do I have much love for goblins, but I am sure there are plenty of buyers out there who think otherwise. Special/side event Grand Prix playmats are hard to price objectively—unless it’s a rare piece from an iconic Magic artist, but how do we determine who is iconic and who isn’t? These mats tend to be harder to sell. 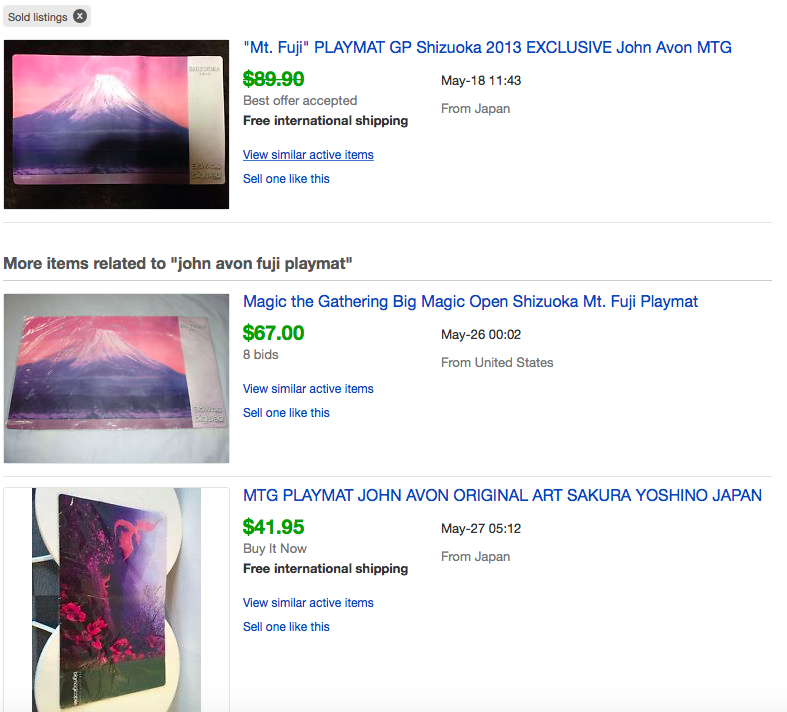 In the eBay screenshots above, most of the special playmats were sold as buy-it-nows rather than auctions, or only had a single bid. 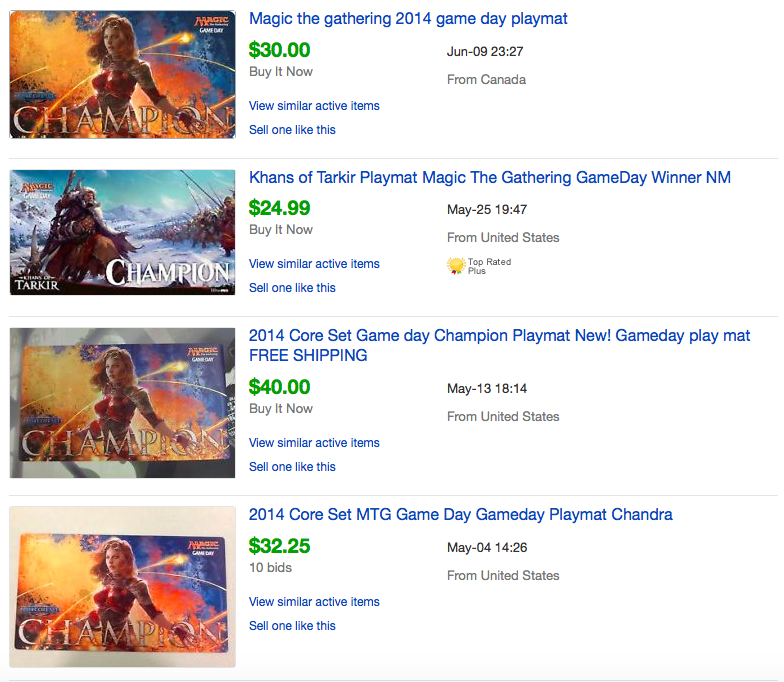 This indicates that the market for these mats are a lot more niche than, say, Grand Prix playmats or Game Day playmats, which feature actual Magic art. This reinforces the point that Grand Prix specials are hard to price. 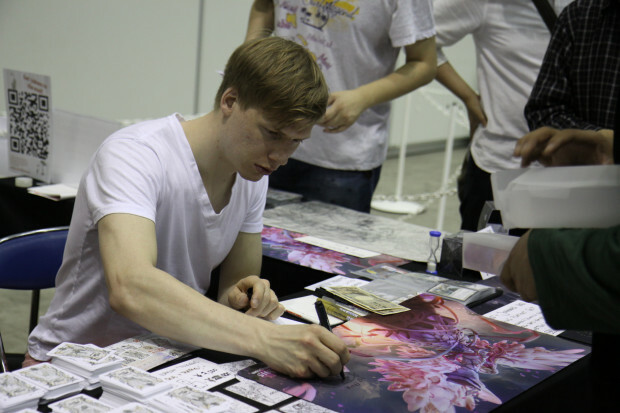 Rob Alexander is an undeniably popular and established Magic artist, yet his recent Grand Prix Singapore mat only went for a third of his Grand Prix Kyoto special. If I’ve ever wanted to go to a Grand Prix just for its playmat, it would be this one. While there are double-sided artless leather playmats you can buy out there, this will be the first time we see a double-sided rubber-and-fabric playmat featuring Magic art, utilizing a new printing technique engineered by Ultra Pro, according to the Grand Prix San Diego website. While Magali Villeneuve is not as established as the likes of Terese Nielsen and John Avon, some of the art she has done is just plain gorgeous and I would not be surprised to see her gaining traction in the realm of Magic art. More importantly, Narset, Enlightened Master has solidified herself as one of the most popular EDH generals to emerge from a recent set (she currently ranks second in MTGSalvation’s monthly count of popular generals). That, together with the novelty of being the first ever double-sided Magic playmat, is probably going to make this Grand Prix San Diego perk one of the most sought-after playmats in recent years. Join me next week for the third and final part of the Playmat Finance series, where we will discuss the issue of counterfeit playmats, as well as how to take care of your playmat, a topic which a surprising number of readers were interested in. In the meantime, do share your thoughts in the comments segment below or catch me on Twitter at @theguoheng. Where did you get the idea that this is curling? I’m not saying you’re necessarily wrong, but the sticks they are using are shaped like hockey sticks, not brooms. They’re also on skates and the goblin is on a puck-shaped object (not a stone). It sure seems like hockey to me. The goblins are playing hockey. Hockey stick, puck, skates give it a away. Good point about the skates. Oh well, back to ice hockey. Note to self: Refrain from making sports references in the future. The Narset art is not original for a playmat, it was the same for PT Khans Playmat in Hawaii. It being double sided is more important than the art. Good point there. 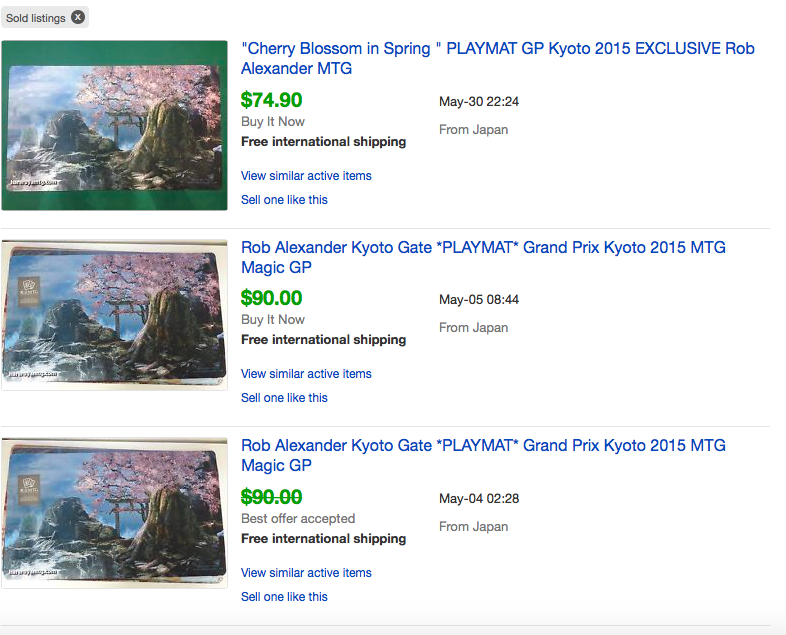 The bulk of the value would certainly be pinned onto the fact that it’s the first double-sided Grand Prix mat. While this may not be the first time a playmat features Narset, Enlightened Master, the fact that it features a popular EDH general would likely help sustain its long-term value. The thing that I can’t get over re: double-sided playmat is that the side you like less is going to get filthy very quickly. While playmats have grown into artistic expression of players, they still serve a very real function: to keep our cards from touching the often disgusting surfaces at venues. Now 1/2 of your playmat is going to end up being that disgusting and being cloth, it may look even worse. I thought of that too. I’d imagine seeing people use the double-sided playmat on top of another playmat. Playmatception. I’ve heard people make that suggestion – but it’s evidence that the double-sided playmat “experiment” is already a failure if the only way to use it “correctly” is with another playmat to isolate it from the table it’s on. Hey Guo Heng! Like your articles on mtgprice for awhile now. I happen to be in the SD area and was planning on attending the GP, and if you’re interested in the Narset flip playmat, could look to get or trade for one and send to you at cost. Appreciate all the content. Let me know!